Walking over rough sandstone blocks, between adobe houses, our $20/person tour wove through the streets and alleys of a small village atop a mesa in the Acoma Pueblo, in New Mexico. The tour culminated in the local church (at right), the San Esteban del Rey Mission, which is a source of great pride, and also a symbol of Catholic persecution of traditional peoples. The earthen walls are many feet thick, and the roof is supported by centuries-old logs. Following our cheerful tour guide (and a friendly puppy), we walked past electricity-free, plumbing-free homes with squared-off architecture, soothing earthen colors, and inspiring ceremonial ladders pointing towards the sky. Most houses are summer homes, though a few are occupied year round by elders. (Other members of the tribe live in contemporary housing in two other communities nearby.) Dirt and straw plaster the walls, replaced every year or so, depending on the rains. The tour was something you might be more likely to expect in Morocco or Israel, walking over ancient walkways, with stories of rebellions and attacks from the 1500’s retold as if they occurred the other day. A few stray gasoline generators, pickup trucks, and portable toilets are the only indicators of modern life. I saw this community last week, as part of a short vacation in New Mexico. In addition to a casino (which most of the Indian Reservations in the region have as a revenue draw), hotel, restaurant and hunting… the Acoma have fashioned a great cultural and historical museum. This tour was a delightful reminder that the visitor experience is the most important thing, and that the financial future of museums may lie in selling experiences, not just access to objects and exhibitions. Indeed, artifacts and objects often better experienced on tablet computers where visitors can spin objects in 3D and zoom in and out. Of course, most museums don’t have ancient cities around the corner. 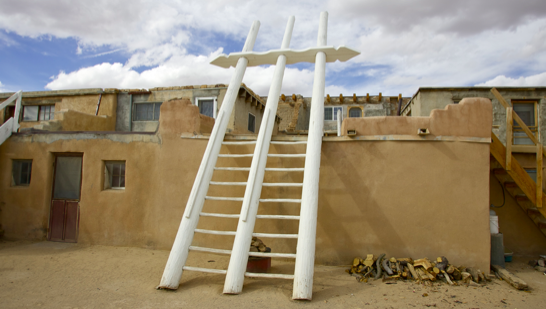 But museums can draw on the spirit of Acoma Pueblo, using the museum itself as a context for other kinds of experiences such concerts, storytelling, re-enactments and other performances. The approach of the living museum is used various places, such as Colonial Williamsburg, but the concept can be extended more broadly in museums of science and culture. Penobscot Nation Museum (Indian Island, Maine) — “The Penobscots are the original natives of Maine, and their reservation is near Old Town. Visit their small museum and see a birch-bark canoe made without screws or nails, sewn up with spruce root and waterproofed with pine pitch,” Scheirbeck said. Alaska Native Heritage Center (Anchorage) — The center is a gathering place to celebrate Alaska’s 11 distinct native cultures in art, song, storytelling and dance. Guided tours and sleigh rides also are available. “The train ride from Anchorage into Denali National Park, with its caribou, moose, glaciers and Mount McKinley, is a must,” Scheirbeck said. Red Cliff Band of Lake Superior Chippewa (Bayfield, Wis.) — A managed fish hatchery open for tours. Murals depicting traditional ways of life. Basket makers and weavers sell wares. Blackfeet Nation (Northwestern Montana) — The hotel lodge has frequent performances of Indian singing, dancing and theater. Annual powwows and all-American Indian days. Navajo Nation (Window Rock and Chinle, Ariz.) — Window Rock is a hole in a 200-foot sandstone hill, and site of its tribal museum and zoo. Chinle is the mouth of the Canyon de Chelly National Monument of hundreds of ruins and sacred places. “Hike to the bottom of the canyon-like valley and see Navajos farming there,” Scheirbeck said. 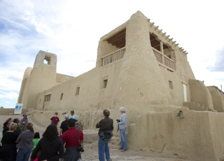 Taos Pueblo, N.M. — Multistoried adobe buildings over 1,000 years old. UNESCO World Heritage Site. Some ceremonial dances are open to the public and the annual powwow. However, it’s closed for much of the spring for ceremony (I missed it).